Figure 17.16). The behavior of light can be discussed in terms of the behavior of waves and also in terms of the behavior of the fundamental unit of light—a packet of electromagnetic radiation called a photon. A glance at the electromagnetic spectrum shows that visible light for humans is just a small slice of the entire spectrum, which includes radiation that we cannot see as light because it is below the frequency of visible red light and above the frequency of visible violet light. 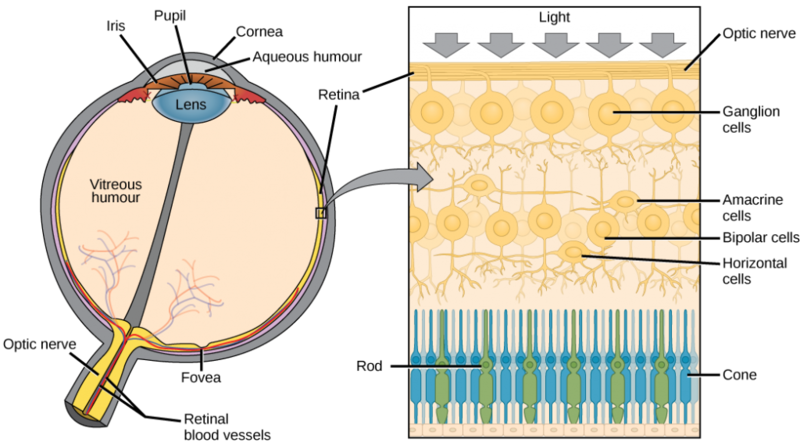 The photoreceptive cells of the eye, where transduction of light to nervous impulses occurs, are located in the retina (shown in Figure 17.17) on the inner surface of the back of the eye. But light does not impinge on the retina unaltered. It passes through other layers that process it so that it can be interpreted by the retina (Figure 17.17b). The cornea, the front transparent layer of the eye, and the crystalline lens, a transparent convex structure behind the cornea, both refract (bend) light to focus the image on the retina. The iris, which is conspicuous as the colored part of the eye, is a circular muscular ring lying between the lens and cornea that regulates the amount of light entering the eye. In conditions of high ambient light, the iris contracts, reducing the size of the pupil at its center. In conditions of low light, the iris relaxes and the pupil enlarges. Figure 17.17. (a) The human eye is shown in cross section. (b) A blowup shows the layers of the retina. 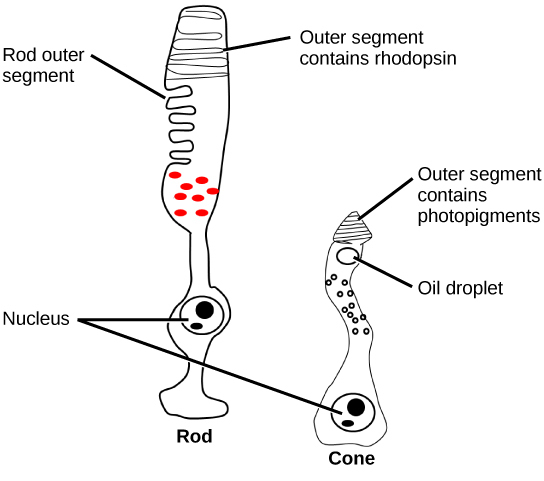 There are two types of photoreceptors in the retina: rods and cones, named for their general appearance as illustrated in Figure 17.18. Rods are strongly photosensitive and are located in the outer edges of the retina. They detect dim light and are used primarily for peripheral and nighttime vision. Cones are weakly photosensitive and are located near the center of the retina. They respond to bright light, and their primary role is in daytime, color vision. 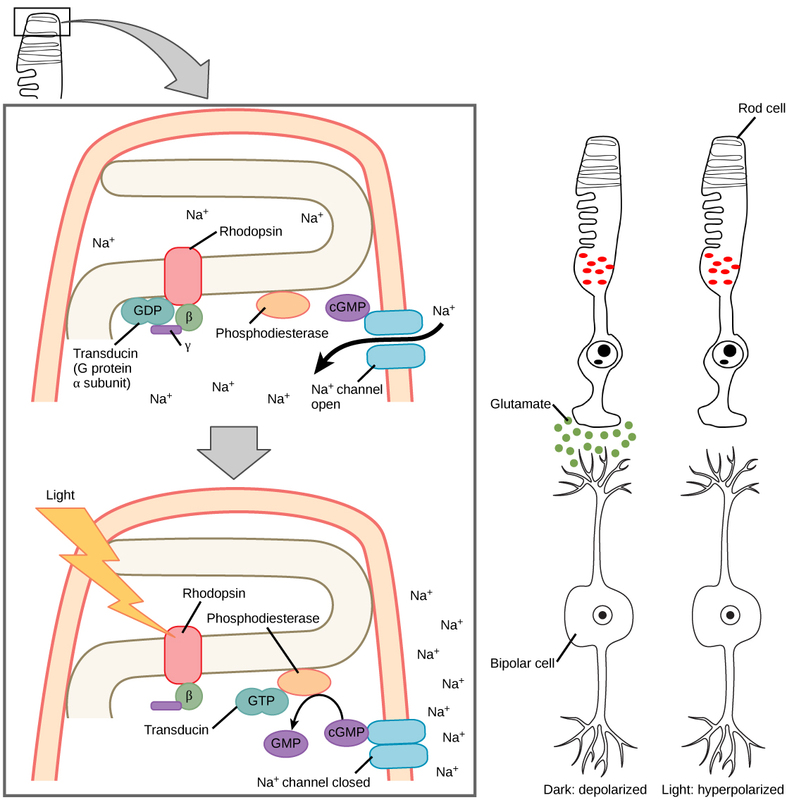 The rods and cones are the site of transduction of light to a neural signal. Both rods and cones contain photopigments. In vertebrates, the main photopigment, rhodopsin, has two main parts Figure 17.19): an opsin, which is a membrane protein (in the form of a cluster of α-helices that span the membrane), and retinal—a molecule that absorbs light. When light hits a photoreceptor, it causes a shape change in the retinal, altering its structure from a bent (cis) form of the molecule to its linear (trans) isomer. 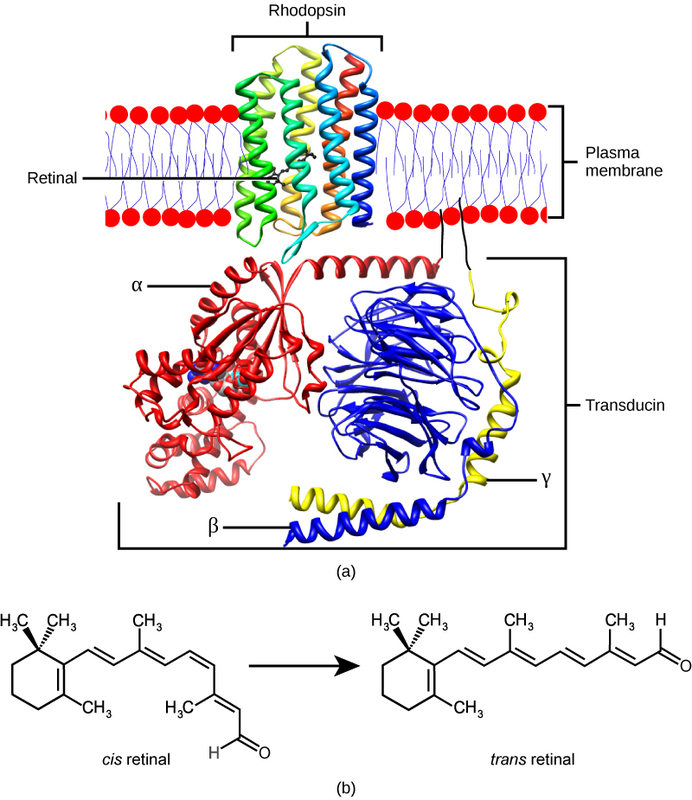 This isomerization of retinal activates the rhodopsin, starting a cascade of events that ends with the closing of Na+ channels in the membrane of the photoreceptor. Thus, unlike most other sensory neurons (which become depolarized by exposure to a stimulus) visual receptors become hyperpolarized and thus driven away from threshold (Figure 17.20). Figure 17.19. (a) Rhodopsin, the photoreceptor in vertebrates, has two parts: the trans-membrane protein opsin, and retinal. When light strikes retinal, it changes shape from (b) a cis to a trans form. The signal is passed to a G-protein called transducin, triggering a series of downstream events. There are three types of cones (with different photopsins), and they differ in the wavelength to which they are most responsive, as shown in Figure 17.21. 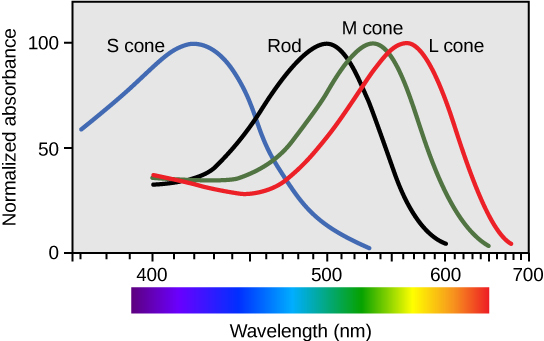 Some cones are maximally responsive to short light waves of 420 nm, so they are called S cones (“S” for “short”); others respond maximally to waves of 530 nm (M cones, for “medium”); a third group responds maximally to light of longer wavelengths, at 560 nm (L, or “long” cones). With only one type of cone, color vision would not be possible, and a two-cone (dichromatic) system has limitations. Primates use a three-cone (trichromatic) system, resulting in full color vision. 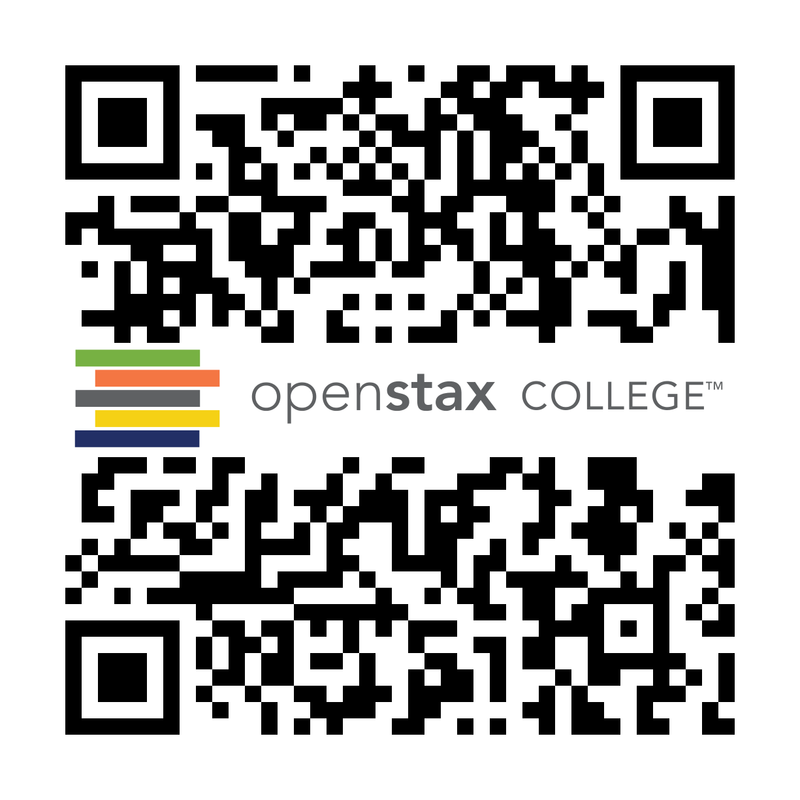 You can demonstrate this using an easy demonstration to “trick” your retina and brain about the colors you are observing in your visual field. Look fixedly at Figure 17.22 for about 45 seconds. Then quickly shift your gaze to a sheet of blank white paper or a white wall. You should see an afterimage of the Norwegian flag in its correct colors. At this point, close your eyes for a moment, then reopen them, looking again at the white paper or wall; the afterimage of the flag should continue to appear as red, white, and blue. What causes this? 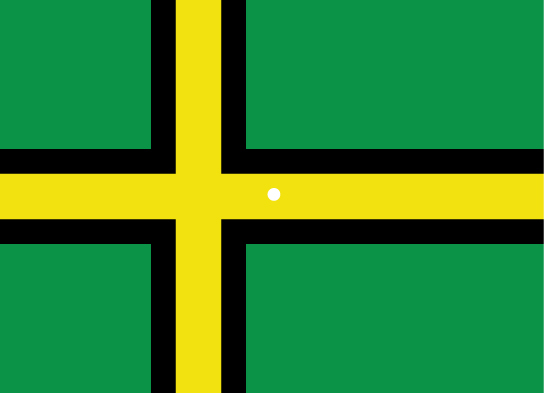 According to an explanation called opponent process theory, as you gazed fixedly at the green, black, and yellow flag, your retinal ganglion cells that respond positively to green, black, and yellow increased their firing dramatically. When you shifted your gaze to the neutral white ground, these ganglion cells abruptly decreased their activity and the brain interpreted this abrupt downshift as if the ganglion cells were responding now to their “opponent” colors: red, white, and blue, respectively, in the visual field. Once the ganglion cells return to their baseline activity state, the false perception of color will disappear. Figure 17.22. View this flag to understand how retinal processing works. Stare at the center of the flag (indicated by the white dot) for 45 seconds, and then quickly look at a white background, noticing how colors appear. 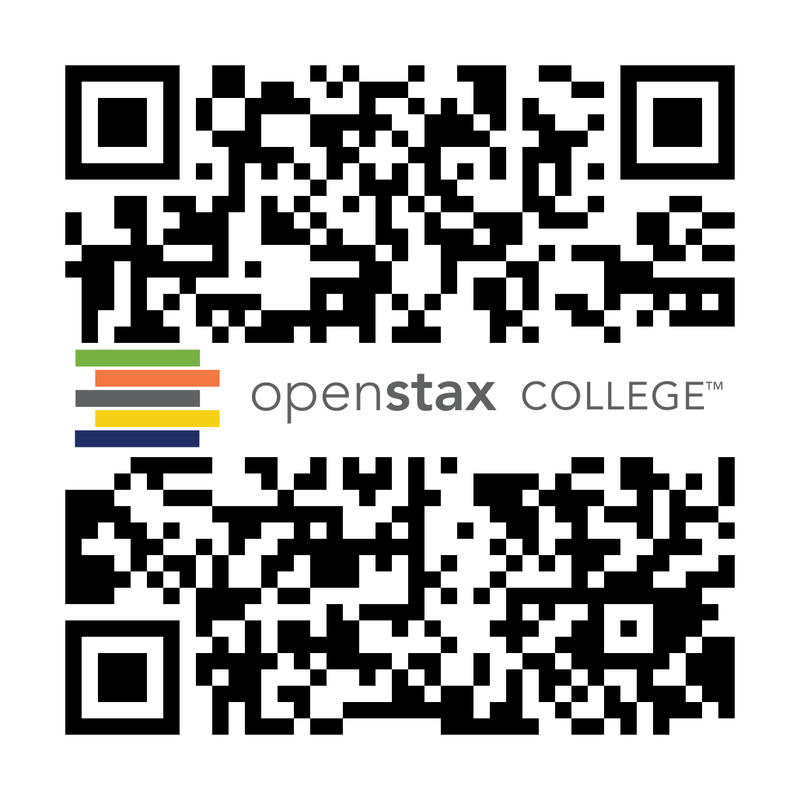 interactive presentation to review what you have learned about how vision functions. 17.5 Vision by Charles Molnar and Jane Gair is licensed under a Creative Commons Attribution 4.0 International License, except where otherwise noted.